The Chatham Athletic Association is now accepting internship applications for the upcoming summer. These positions include assisting the Chatham Athletic Association and volunteers in many activities required to ensure our fans enjoy their Chatham Anglers baseball experience. The Anglers Media Team is responsible for all public relations, broadcasting, digital media and social media. Specific positions are outlined below. The web reporter writes game recaps and stories for ChathamAnglers.com, updates Twitter and Facebook, and works in conjunction with the rest of the Media Team to get pertinent information and media to the public. Journalism majors preferred. When applying, please submit formal cover letter, resume and writing samples, preferably baseball related. Successful candidate must provide his/her own housing proximate to Chatham, MA. Please email resume, cover letter and writing samples to Dan D'Uva at ChathamBroadcast@gmail.com with subject heading "Chatham Beat Reporter." The Chatham Athletic Association seeks student to serve photography, digital media position within "Anglers Media Team." The "photographer" will be one of five students comprising the "Media Team" covering all Chatham Anglers (Cape Cod Baseball League) games for the 2019 season (mid June to mid August). The photographer will shoot still images at all games and team functions with a focus on storytelling. Additional responsibilities include editing and uploading images, managing team Flickr page, integrating images into website, social media and team publications. May include opportunity for creative graphic design and video elements. Successful candidate must provide his/her own housing proximate to Chatham, MA. Photographer follows the direction of broadcast advisers and play-by-play broadcasters. Preferred experience: sports photography, Adobe Creative Suite, Flickr, website management. Please email resume, cover letter and photography samples to Dan D'Uva at ChathamBroadcast@gmail.com with subject heading "Chatham Photographer." The Chatham Athletic Association seeks student to serve video production position within "Anglers Media Team." The "videographer" will be one of five students comprising the "Media Team" covering all Chatham Anglers (Cape Cod Baseball League) games for the 2019 season (mid June to mid August). The videographer will shoot video of all games for live streaming broadcast. Additional responsibilities include shooting interviews, editing broadcast packages, cutting video highlights for each game, directing live video broadcasts, managing team YouTube channel, integrating video into website, social media. May include opportunity for on-air contributions. Successful candidate must provide his/her own housing proximate to Chatham, MA. Videographer follows the direction of broadcast advisers and play-by-play broadcasters. Preferred experience: live sports videography, television production, Adobe Creative Suite, YouTube. Please email resume, cover letter and video links to Dan D'Uva at ChathamBroadcast@gmail.com with subject heading "Chatham Videographer." The Chatham Anglers (a.k.a. 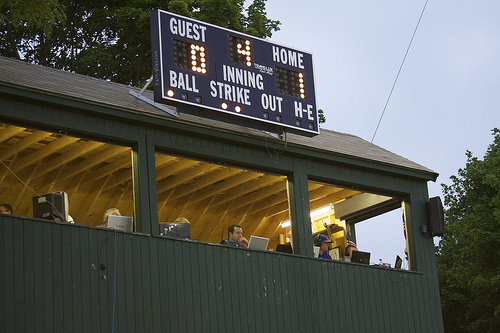 Chatham A's) of the Cape Cod Baseball League seek an undergraduate student to join the "Anglers Media Team" as Play-By-Play Broadcaster for the 2019 season (and, potentially, the 2020 season). Successful candidate will team with another student broadcaster for split play-by-play duties. Broadcasters coordinate "Anglers Media Team" operations. Manage all press box operations and broadcast equipment. Direct all media efforts including website content & management, team publications, video production, social media (Twitter, Facebook, Instagram) and digital media (YouTube, SoundCloud, Flickr), etc. Engage audience, fans and community. Please email resume, cover letter, references, writing samples and broadcast samples (links or attachments) to Dan D'Uva at ChathamBroadcast@gmail.com with subject heading "Chatham Play-By-Play." Going through the crowd with baseball players and other interns to solicit raffle sales and attendance contributions. Providing administrative assistance (e.g. filling out registrations, collecting money, giving instructions, passing out t-shirts) for our week-day morning baseball clinic. Providing assistance (e.g. setting up tables, passing out food, picking up and delivering food) to help feed our players after every game. Providing assistance to our Concession stand volunteers (e.g. grilling, clean-up, transporting food/drink, occasionally sales/serving) at all home games. Providing assistance to our Merchandise volunteers (e.g. set-up, take down, sales) at all home games. Going through the bleachers after each home game disposing of any remaining garbage items. To apply for a Game Day Operations internship please contact Brian Voelkel brian@mahigold.com with the subject heading "Chatham Internship."